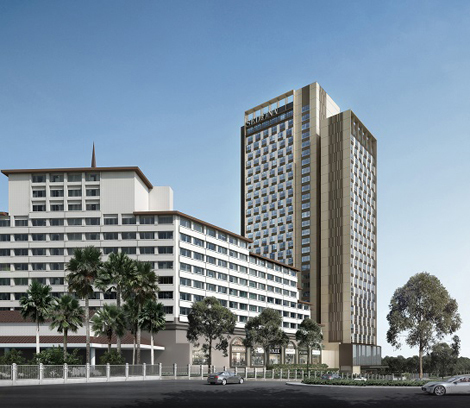 A new 29-storey wing will be added to the five-star Sedona Hotel Yangon in Myanmar, due to open at the end of the year. Named after the largest lake in Yangon, the Inya Wing will offer an additional 431 guestrooms – more than doubling the current offering of 366 rooms, which have also been upgraded. It will also include an upscale shopping gallery, a new fitness centre, all-day dining restaurant, luxury spa and an executive lounge, increasing amenities for both business and leisure guests. The new wing has been designed by Studio HBA, who have drawn inspiration from traditional Burmese culture to create an elegant and contemporary décor. The massive extension comes as Myanmar is experiencing a surge in tourism numbers and a steadily improving economy. “We are excited about the opportunities to grow with Myanmar as it opens up and attracts more businesses and foreign investments, as well as tourists,” said Ang Wee Gee, CEO of Keppel Land as reported by Travel Daily Asia.